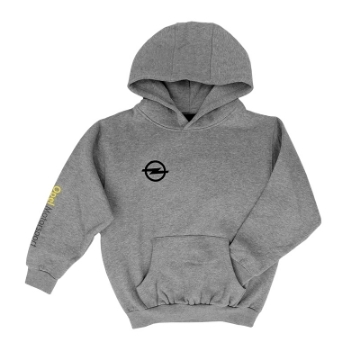 This trendy hoodie with Opel Motorsport print and embroidered Opel lightning bolt makes it clear what sets the little wearer's heart racing! Thanks to the soft interior and kangaroo pocket, it is not only practical but comfortable at the same time. The kids' t-shirt with "Opel Motorsport" lettering and silver embroidered Opel lightning bolt really sets the little motorsport fans in scene!